Viral hemorrhagic fevers (VHFs) are major public health problems in the South-East Asia Regional (SEAR) countries. VHFs are a group of illnesses; that are caused by four families of viruses, viz. Arenaviridae, Bunyaviridae, Filoviridae and Flaviviridae. All VHFs have common features: they affect several organs and damage the blood vessels. These symptoms are often accompanied by hemorrhage. To understand pathogenesis, genetic and environmental influence that increase the risk of VHFs, efficacy and safety studies on candidate vaccines and testing of various therapeutic agents, appropriate animal models are essential tools in public and animals health. In the current review, the suitable animal models for Flavivirus [Dengue hemorhagic fever (DHF), Kyasanur forest disease (KFD)]; Bunyavirus [Crimean-Congo hemorrhagic fever (CCHF), Hantavirus fever (HF)]; and Paramyxovirus [Nipah virus fever (NiV)] have been reviewed with specific emphasis on emerging and reemerging viruses in SEAR countries. Background & objectives: Combating viral diseases has been a challenging task since time immemorial. Available molecular approaches are limited and not much effective for this daunting task. MicroRNA based therapies have shown promise in recent times. MicroRNAs are tiny non-coding RNAs that regulate translational repression of target mRNA in highly specific manner. Methods: In this study, we have determined the target regions for human and viral microRNAs in the conserved genomic regions of selected viruses of Flaviviridae family using miRanda and performed a comparative target selectivity analysis among them. Results: Specific target regions were determined and they were compared extensively among themselves by exploring their position to determine the vicinity. Based on the multiplicity and cooperativity analysis, interaction maps were developed manually to represent the interactions between top-ranking miRNAs and genomes of the viruses considered in this study. Self-organizing map (SOM) was used to cluster the best-ranked microRNAs based on the vital physicochemical properties. Interpretation & conclusion: This study will provide deep insight into the interrelation of the viral and human microRNAs interactions with the selected Flaviviridae genomes and will help to identify cross-species microRNA targets on the viral genome. Background & objectives: Several studies have demonstrated genetic heterogeneity in populations of Trypanosoma cruzi that allowed the identification of six different discrete typing units (DTU) classified as TcI, TcII, TcIII, TcIV, TcV and TcVI. Furthermore, some characterization studies have described genetic variability within TcI isolates from endemic regions. The objective of the present study was to analyze Venezuelan T. cruzi isolates, obtained from triatomine-vectors, mammal-hosts including infected humans, detected in both rural and urban areas from diverse geographic origins. Methods: Molecular characterization of 44 Venezuelan T. cruzi isolates, obtained from triatomine-vectors, mammalian hosts and human patients from both rural and urban areas of different geographic origins, were carried out. Samples were analyzed by PCR amplification of the intergenic region of the mini-exon gene, 24Sα rDNA and 18S rDNA, followed by sequencing of the amplification products. Results: The TcI amplification pattern was found in 42 out of 44 (95.5%) isolates; a TcIII strain and one possible TcIV were also found. The sequence analysis of the TcI Venezuelan isolates showed genetic variability among them. Urban isolates formed a homogeneous group, with differences in their sequences, when compared to rural isolates. Interpretation & conclusion: The results showed genetic heterogeneity in Venezuelan TcI strains, probably in response to different environmental conditions. Objective: In this case-control study, we investigated whether IL-6 (-174G/C) and TNF-α (-308G/A) gene polymorphisms affect the clinical course and outcome of CCHF. Methods: Total 150 patients with CCHF and 170 controls were examined in this study. Genotyping of these polymorphisms were performed by PCR-RFLP methods. Results: We found no statistically significant differences in genotype and allele frequencies of these polymorphisms between patients and controls [(χ2 = 1.31, p = 0.51 for TNF-α) and (χ2 = 2.61, p = 0.27 for IL-6)]. Either TNF-α AA or IL-6 CC genotypes in dead cases were not observed in this study. Frequency of heterozygous genotypes in both IL-6 (GC) and TNF-α (GA) was higher in dead patients than living patients. However, the difference was not statistically significant. A significant difference was found in AST levels and INR when compared to patients with CCHF who died and who survived [OR = 13.9 (95% CI = 1.79-107) for INR, p = 0.01] and [OR = 23.3 (95% CI = 3.62-149) for AST, p = 0.001], respectively. Conclusion: We did not find a significant association of IL-6 -174G/C and TNF-α -308G/A polymorphisms on the prognosis of CCHF and mortality in this study. We suggest that AST and INR may be important biomarkers for determining the risk of severity and death as a result of infection with Crimean-Congo hemorrhagic fever virus (CCHFV). Background & objectives: Crimean-Congo hemorrhagic fever (CCHF) is a tick-borne viral disease, causing severe viral hemorrhagic fever outbreaks. This study aimed at determining the serum vitamin D levels and investigated the association between Crimean-Congo hemorrhagic fever (CCHF) and serum vitamin D levels in children with CCHF. Methods: A total of 45 children aged between 5 and 15 yr, viz. 15 healthy control (HC) and 30 pediatric patients diagnosed with CCHF with real-time polymerase chain reaction (PCR) (patient group) were selected for the study. Results: Analysis of the blood serum samples taken from the said individuals revealed that vitamin D, parathyroid hormone and calcium levels of the patients and the control groups were statistically different. Interpretation & conclusion: It was found that the serum vitamin D levels of the pediatric patients with CCHF were lower when compared to those of the controls, and that a low vitamin D level could negatively affect the reaction of the body to infections in children having CCHF. Background & objectives: Culex tritaeniorhynchus (Diptera: Culicidae), an important vector of Japanese encephalitis belongs to the Culex vishnui subgroup which includes two other vector species namely, Cx. Vishnui and Cx. pseudovishnui. Many varieties and types of Cx. tritaeniorhynchus have been reported, besides populations that exhibit behavioural and biological differences. This study was undertaken to find out whether Cx. tritaeniorhynchus populations exhibiting behavioural and biological variations, and those from different geographical areas, are comprised of more than one taxon or belong to a single taxon. Methods: Morphological characterization was done by examining 153 morphological and morphometric characters in the larval (75), pupal (60) and adult stages (18) of five geographical populations of Cx. tritaeniorhynchus. Molecular characterization was done by PCR amplification of mitochondrial cytochrome c oxidase (COI) gene sequences (DNA barcodes) and another hypervariable genetic marker, the ribosomal DNA (16S). One-way ANOVA, principal component analysis (PCA) and discriminant factor analysis (DFA) were done for statistical analyses using the statistical package SPSS IBM version 19.0. Results: Morphological characterization showed that no intraspecific differentiation can be made among the five geographical populations of Cx. tritaeniorhynchus. Molecular characterization done by DNA barcoding also showed that the COI sequences of all the five populations of Cx. tritaeniorhynchus grouped into a single taxonomic clade plus the genetic differentiation among these was non-significant and the overall gene flow among the populations was very high. Analysis of the ribosomal DNA also confirmed that the Cx. tritaeniorhynchus populations belonged to a single taxon. Interpretation & conclusion: Culex tritaeniorhynchus is a taxon that does not involve cryptic species. Background & objectives: Mosquito gut is a rich source of microorganisms. These microorganisms exhibit close association and contribute various physiological processes taking place in mosquito gut. The present study is aimed to characterize two bacterial isolates M19 and GB11 recovered from the gut of Culex quinquefasciatus mosquito collected from Bhuj and Jamnagar districts of Gujarat, India. Methods: Both the strains were characterized using polyphasic approach including, phenotypic characterization, whole cell protein profiling and sequencing of 16S rRNA gene and groESL region. Results: Sequences of 16S rRNA gene of M19 and GB11 were 99% similar to Vagococcus carniphilus and Vagococcus fluvialis. But phenotypic profile, whole cell protein profile and sequence of groESL region of both isolates were found to be similar to V. fluvialis. Conclusion: Based on phenotypic, genotypic and protein profiling, both the strains were identified as V. fluvialis. So far this species was known from domestic animals and human sources only. This is the first report of V. fluvialis inhabiting midgut of Cx. quinquefasciatus mosquito collected from Arabian sea coastal of India. Background & objectives: A cyclic lipopeptide (CLP), surfactin produced by a strain of Bacillus subtilis subsp. subtilis (VCRC B471) was found to exhibit mosquitocidal activity. The present study was carried out to enhance the surfactin level using low cost material in the production medium. Methods: Two carbon sources, glucose and common sugar, and two nitrogen sources, ammonium nitrate and soya were used in the study. Different concentrations of 'C' and 'N' sources were used in the production medium to enhance the production of surfactin. Results: A new medium (SS7) containing 2% sugar, 6% soya and 0.5% common salt with micronutrients was designed which was found to enhance the production of surfactin. The crude mosquitocidal metabolite (CMM) produced in this medium was 3 g/l which was two times higher than that obtained using synthetic medium NYSM. The LC50 dosage of the CMM to the pupal stages of An. stephensi (2.3 μg/ml) was comparable to that obtained with CMM from the conventional medium. Interpretation & conclusion: The newly designed cost-effective medium designated as sugar soya medium (SSM) enhanced the production of surfactin and the cost of production was estimated as ₹ 6 per litre, which is six times lesser than that of the conventional medium. Replacement of sodium chloride with cooking salt further reduced the cost of the medium. Background & objectives: This paper presents the results of a study on ecological parameters including diversity indices applied on populations of Culicidae mosquitoes (Diptera: Culicidae) from three rural areas (Darvishan, Chalmardi and Khairabad) of Neka township in Mazandaran province, northern Iran. Methods: Adult and larval stages of mosquitoes were systematically sampled to obtain data required for measuring diversity of mosquitoes in these areas. Alfa and beta indices were analyzed to compare mosquito diversity. A total of 5270 specimens belonging to four genera and 14 different species were collected and identified. Results: Evaluation of dominance structure of species showed that culicid mosquitoes of Neka rangelands include one eudominant species, two dominant species, two subdominant species, two rare species and eight subrare species when Heydemann classification was used. Interpretation & conclusion: Data analysis revealed a higher diversity of mosquitoes in Khairabad with a low degree of interspecific dominance, while Darvishan and Chalmardi recorded the lowest observed diversity and a high degree of interspecific dominance. The cluster analysis based on Jaccard's index indicated the relationship between the categories and indicates that Darvishan and Khairabad are the closest categories in their specific composition. 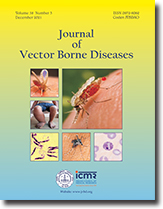 Background & objectives: Tropical and vector borne diseases have always been a challenge for the medical science and society and exerted high impact on society in terms of financial, economical and psychological relevance. Lymphatic filariasis (LF) is one of the tropical diseases which is prevalent in under developing and developed countries. The objective of this study is to analyze the literature published in the area of filariasis research. The focus is to see the Indian contribution and its impact in terms of global publication and share, citation analysis and its impact, productive Indian institutions engaged in filariasis research and their impact, international collaborative research, productive journals, and highly cited papers published by Indian authors. Methods: The data for this study was obtained from Scopus, a multidisciplinary database, for the period of forty years (1973-2012) using key words lymphatic filariasis, elephantiasis, Wuchereria bancrofti, Brugia malayi and Brugia timori available in the title, abstract and key words fields. The citation count has been taken as the number of citations scored by the papers since their publication. The international collaboration by Indian authors in filariasis research has been manually analyzed through author's affiliation field. Results: The search strategy using key words yielded 13,598 articles on different aspects of filariasis published during the forty years period. Indian authors have published 1970 articles which is 14.49% of global share, making it second highest productive country on filariasis research. United States holds first rank with 2956 articles (21.74% share). In terms of citation count, Indian research have quite good impact and has been ranked third; and in terms of average citation per paper it is far behind, while Ghana and Nigeria holds top two ranks. Interpretation & conclusion: There have been continued efforts in providing better facilities for research, though Indian filariasis research has to go long way in order to remove the incidence of the disease from Indian population and the results presented through this study shall be helpful for stakeholders in framing policies in this direction. Background & objectives: Mosquito larvae can develop in fresh, salty and brackish water. The larvae of Aedes aegypti develop in fresh water. However, in laboratory studies, tolerance of this species for oviposition and hatching in brackish water was observed. Immature forms of Ae. aegypti have also been found developing in brackish water in coastal areas. The purpose of the study was to compare the effects of salt on the biological cycle of Ae. aegypti populations from coastal and plateau areas of southeastern Brazil. Methods: Aedes aegypti were collected from plateau (Taubaté) and coastal (São Sebastião) municipalities to establish colonies. Specimens of the F1 generation were exposed to five salt concentrations (3.5, 7, 10.5, 14 and 17.5‰) to assess the oviposition and cycle development from egg hatching to adult eclosion. Deionized water was used in the control groups. Results: Both Taubaté and São Sebastião populations oviposited in all salt concentrations tested; however, development occurred in all except in the 17.5% concentration. Significant differences in development and adult size were observed at intermediate concentrations (São Sebastião from 10.5‰ and Taubaté from 7‰, for both variables) between the two populations. Interpretation & conclusion: The results of this study showed different response patterns to salinity between the two populations, suggesting better adaptive adjustment of the coastal population to the metabolic constraints exerted by salt. The implications of this adaptation are discussed, and additional studies are suggested to evaluate the mechanisms that determinate the adaptive processes of Ae. aegypti in brackish water and the implications to its vectorial capacity. Background & objectives: Screening of crude extracts of plants facilitates the establishment of highly effective extract for mosquito control. This practice should be preferred before in depth study of plant extracts rather than spending much efforts and energy in detailed examinations for practically ineffective extracts. In this study, leaf powders of four weed plants were used for the quick screening of effective plant extract as larvicide against III instar larvae of Aedes albopictus Skuse. At the same time, effect of different seasons on the larvicidal efficacy of plants and selection of proper solvents for further investigation were also studied. Methods: Leaves of Vernonia cinerea, Prosopis juliflora, Hyptis suaveolens and Malvastrum coromandelianum plants were collected in summer, winter and rainy seasons from Madhya Pradesh region (India). To assess the larvicidal efficacy the suspensions of leaf powders in different solvents (isopropanol, methanol, acetone, dimethylsulfoxide and water) were used for larvicidal bioassay. The mortality counts were made after 24 h and the LC50 and LC90 values were calculated. Results: Results showed that leaf powder of V. cinerea in acetone collected during summer showed highest efficacy with LC50 value of 0.22 g/l and LC90 of 0.96 g/l followed by methanolic solution of P. juliflora with LC50 of 0.44 g/l and LC90 value as 1.85 g/l. Amongst all solvents, leaf powder in acetone; while among seasons, summer collected plant materials were found to be more effective larvicides as compared to others. Interpretation & conclusion: Summer and winter collected leaves of V. cinerea and P. juliflora dissolved in the solvents of medium polarity range showed significant larval toxicity and thus suggests a detailed study on these plants as potential larval control agents. Background & objectives: Aedes albopictus is one of the vectors for dengue and chikungunya and emergence of pyrethroid resistance in this species could be of a major concern in controlling the vector. This study reports insecticide susceptibility status of Ae. albopictus to DDT and pyrethroids in some Indian populations and status of presence of knockdown resistance (kdr) mutations. Methods: Three to four day old adult female Ae. albopictus collected from Delhi, Gurgaon (Haryana), Hardwar (Uttarakhand), Guwahati (Assam) and Kottayam (Kerala) were bio-assayed with DDT (4%), permethrin (0.75%) and deltamethrin (0.05%) impregnated papers using WHO standard susceptibility test kit. Mosquitoes were PCRgenotyped for F1534C kdr-mutation in the voltage-gated sodium channel (VGSC) gene. DDT and pyrethroid resistant individuals were sequenced for partial domain II, III and IV of VGSC targeting residues S989, I1011, V1016, F1534 and D1794 where kdr mutations are reported in Ae. aegypti. Results: Adult bioassays revealed varying degree of resistance against DDT among five populations of Ae. albopictus with corrected mortalities ranging between 61 and 92%. Kerala and Delhi populations showed incipient resistance against permethrin and deltamethrin respectively. All other populations were susceptible for both the synthetic pyrethroids. None of the kdr mutations was detected in any of DDT, deltamethrin and permethrin resistant individuals. Interpretation & conclusion: Ae. albopictus has developed resistance against DDT and there is emergence of incipient resistance against pyrethroids in some populations. So far, there is no evidence of presence of knockdown resistance (kdr) mutation in Ae. albopictus. Background & objectives: For effective management of vector resistance there is a need for new insecticide molecules with novel modes of action. For desired toxic effect of an insecticide, apart from other behavioural aspects, toxicity and chemical nature of the molecule are important that may cause irritability in the mosquito to the insecticide affecting the uptake. In this study, a pyrrole class insecticide, chlorfenapyr (a late acting insecticide) was tested for its irritability against multiple-insecticide-susceptible and -resistant strains of Anopheles stephensi Liston 1901 (Diptera: Culicidae). Methods: Studies were conducted to assess the irritability due to chlorfenapyr, DDT, malathion, deltamethrin and permethrin and intrinsic toxicity of chlorfenapyr in multiple-insecticide-susceptible and -resistant laboratory strains of An. stephensi following standard WHO methods. Results: Chlorfenapyr molecule has shown least irritant effect against susceptible and resistant strains among all the insecticides tested allowing more landing time to the vector species on the impregnated surfaces to pick-up lethal dose. Conclusion: Chlorfenapyr could be an ideal insecticide for management of multiple-insecticide-resistance including pyrethroids.